Category: Makimono (roll). Season: available year round. 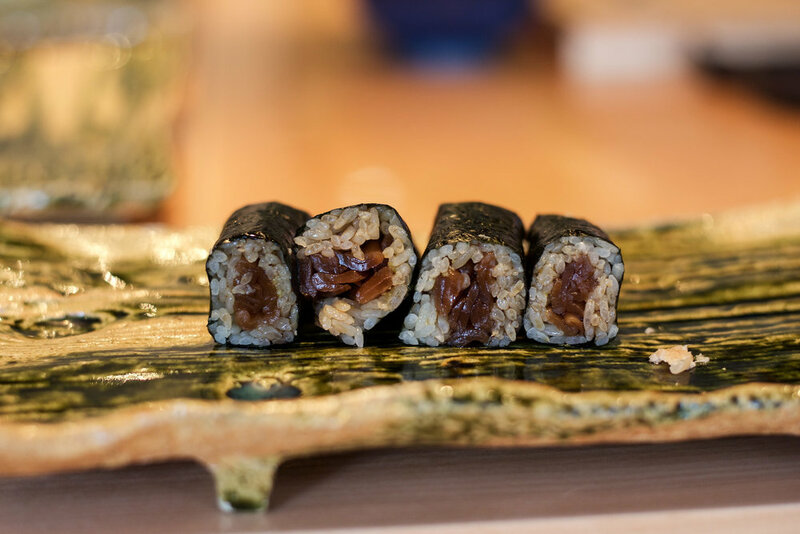 Kanpyo (sometimes spelled kampyo) maki is the most traditional Edomae-zushi maki - as a matter of fact if you order a nori-maki in some of the older Tokyo sushi shops, they will automatically assume that a kanpyo roll is what you are after. Generally served towards the end of the meal, a kanpyo maki will clean the palate and fill you up if you are still hungry. It is a simple dish, but still requires labor-intensive preparation. The gourd is soaked in water for up to 24 hours to soften, then salted, boiled a number of times until very tender, and marinated in soy sauce and sugar. It is then rolled with shari and a half-sheet of crispy nori and usually cut into four pieces. Sometimes, oboro (minced prawn mixed with sugar, mirin and salt) can be added to the roll. The finished product is soft but toothy, mild yet flavorful. A definite Edomae classic.